Packing the punch of extraction and purity of fruit that equal some of the best the New World has to offer, the wines of Valpolicella, and especially those made in the Recioto and Amarone styles, are the perfect "gateway" wines. Yet at the same time these wines from Northeast Italy's Veneto region are still unmistakably Italian, or more accurately, unmistakably Veronese. The fan-shaped collection of communes and vineyards spreading out west, north and east from the ancient city of Verona to the shores of Lake Garda, produce wines that offer an intriguing combination of concentration (alcohol levels routinely approach 16 percent); fruit - in all its possibilities: dried, cooked, macerated and freshly picked; minerality; and deliciously velvety texture. It all starts with Valpolicella, an area within the Veneto region of Northeast Italy around Lake Garda. Like “Chianti”, Valpolicella is a region, not a grape and the red wines produced there are blends dominated by Corvina, with Corvinone and Rondinella usually lending support. Molinara, Negrara, Rossignola, Dindarella and a few other local varieties are also allowed, although have diminished in importance. But it is Corvina that forms the backbone of the blend with its silky tannins and delicious fruity, smoky red cherry flavors and aromas with the deeply colored Rondinella grape adding red currant and citrus components plus color-intensity to the blend. What can be difficult to understand about Valpolicella is that there is a hierarchy of styles. The lighter fruitier styles of Valpolicella Classico wines are what most people associate with the zone, but these are actually more recent creations. They were preceded in history by the sweet Recioto della Valpolicella and it’s dry counterpart, Amarone. Recioto, by most accounts came into fashion during Roman times when wines were made sweet and high in alcohol to preserve them during long travel. The Romans are also said to have developed the process of “appassimento”, in which the grapes were dried in farmhouses on straw mats which transforms them into shriveled, sweet, tiny concentrated berries. To make Recioto, they press these tiny dried berries, but stop fermentation early to retain the high sugar level. Amarone is said to have come about possibly as a mistake, someone left a barrel of Recioto unattended too long, the yeasts in the barrel continued to work and the wine fermented to dryness. Now aged a minimum of 25 months in oak, they are densely concentrated and deeply colored with luscious ripe fruit balanced with a savory robe of alcohol, acidity and tannins. Think leather, coffee, chocolate, stewed blackberry fruit all wrapped up in a rich, viscous and heavenly concoction that just so happens to come out of a wine bottle. Straight Valpolicella Classico (no oak aging required) are the perfect easy drinking wines to have with pizza or pasta or sitting on the porch on warm summer evening. They are vinified in the traditional manner using fresh grapes and usually have little or no oak and present a fresh, fruit forward style with light tannins and tart acidity. The Classico Superior wines can definitely take on a more serious note with 14 months of oak aging required. You have more structure and complexity present which makes them a better match with game and roasted meats, although they are usually wonderfully pleasant on their own as well. Valpolicella Ripassa is a different animal yet. The term Ripassa means “re-passed” and was made famous by Agricola Masi in the 1960’s. 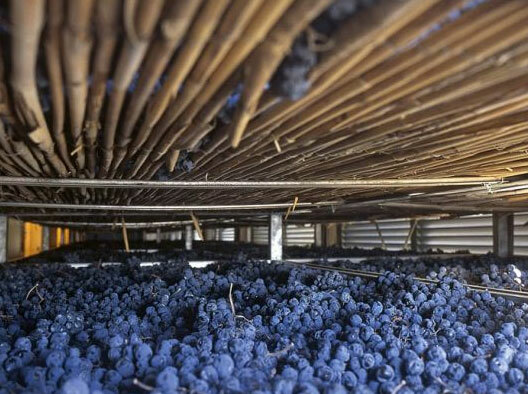 The straight Valpolicella, produced earlier in the usual red wine fashion, is passed "back over" the lees of the Amarone or Recioto after their fermentation is complete. The lees or pomace includes yeast, grape seeds, pulp, stems and skin and traces of alcohol. All of this leads to a second fermentation and the creation of Ripassa Valpolicella whose color, depth and flavors are greater than those of the original Valpolicella. Sometimes referred to as baby Amarone, it is also ready to drink much sooner than the Amarone and usually comes in at a third of the price. One of the great things about Valpolicella is that you can experience the different aging and vinification processes across a spectrum of price points and styles. Basic Valpolicella is usually priced in the teens, Valpolicella Classico and Superior are priced in the high teens to low 20's, Ripassa style usually starts in the 20's to mid 30's, while most Amarone and Recioto (Recioto is sold usually in 375 ml bottles) wines begin in the $50 range and go from there. Currently we are carrying a few different styles of Valpolicella, each chosen for their unique expression of the region, vinification process and quality. But as with every thing else in our store, my selection changes frequently although you will always find at least one Valpolicella on our shelves. Franciacorta, What's Not to Love?